The last candidate for dean of the College of Engineering will have a session open to the University community at 3:30 p.m. Wednesday, May 4, in Room 204 of the Architecture Building. Each candidate will speak and then answer questions. Raphael Lee is the Paul S. and Allene T. Russell Professor of Surgery for the Pritzker School of Medicine at the University of Chicago. He is also a professor of dermatology, biomechanics, and molecular medicine. Dr. Lee is director of the university's Center for Synthetic Molecular Chaperone Development and the Molecular Cell Repair Research Center. Visit the Senior Leadership Searches webpage to learn more about the dean search for the College of Engineering as details become available. President Vistasp Karbhari spent time with several winners recently. At left, he honored history Professor Jerry Rodnitzky for 50 years at UTA along with other employees at receptions for service awards and the 2016 Outstanding Mavericks. At right, Dr. Karbhari joined UTA student Daniel Velasquez at the 33rd Annual Barbara Jordan Media Awards on Saturday, April 24. 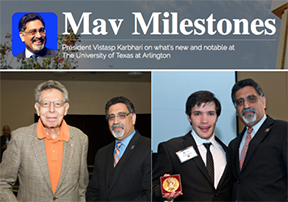 Read more about these and other UTA happenings in the blog Mav Milestones. Read about outstanding faculty members honored at the Spring Meeting of Faculty and Associates and this year's Outstanding Mavericks and employee service awards. Share your opinions with UTA Libraries in a simple, anonymous, and confidential survey. In exchange for your ideas and opinions about the Libraries' products and services, you have chance at winning one of five $100 prizes when you opt in to the grand prize giveaway. Questions or comments? Email utalibqual@listserv.uta.edu. The UTA Police Department seeks your opinion regarding its performance in serving the community. Take a moment to say what you think via the survey link. Your input will help enhance UTA PD's professionalism and the services provided to students, faculty, staff, and visitors. To allow for an upgrade of the water and sewer lines, Facilities Management will close South Nedderman Drive from Cooper Street to Planetarium Place to all traffic at noon on Friday, May 13, for an indefinite time period. The closure includes the exit from Lot F-10. Deliveries to the Central Library and Life Science Building will need to be made from West Street. Visitors to the Planetarium also will need to use West Street. Pedestrians will be redirected from the south student parking lots and Parking Lot F-10. Questions? Contact Jeff L. Johnson at jljohnson@uta.edu or 817-798-8456. Share photos of your decorated graduation cap using #MavGrad2016 for a chance to win a UTA alumni prize pack filled with the ultimate Maverick swag. All photos must be submitted on Facebook, Twitter, or Instagram using #MavGrad2016 by 11:59 p.m. on Friday, May 6. One winner from each social network will be announced by 5 p.m. Wednesday, May 11. Last day for classes for spring semester. First day of classes for summer intersession and summer 14-week session. Graduates participating in Commencement and their guests must have tickets to attend the ceremony. Children age 2 and younger do not need tickets. Look for instructions on claiming tickets in your UTA email account. Visit the Commencement website for details on ticket quantities and availability. Commencement ceremonies are Thursday-Saturday, May 12-14 in College Park Center. Summer intersession begins Wednesday, May 18. Class dates are online. To register for summer intersession classes, select the term 2165 on the schedule of classes and click on the Additional Search Criteria link on the lower left. Each summer session has its own due date. For more information, visit the Student Financial Services website. Final grades for the spring semester are scheduled to be available after noon Thursday, May 19. View grades by logging in to MyMav. When the grades are official, a notice will be posted on the MyMav portal. Grades are sometimes viewable before all end-of-term processes are completed, so check the message on the portal to be sure they have been announced as official. Priority registration has opened for summer and fall terms. Advising is available in your academic department. Check for your appointment on the registration timetable, which is available in your MyMav Student Center along with information on whether you need to see an academic adviser before you’re eligible to register. See a list of academic advising offices. Explore how UTA began to become a model accessible campus for students with disabilities at the Central Library. "Building a Barrier-Free Campus” introduces viewers to both UTA’s status as a leader in disability accessibility today and the multi-championship-winning Movin’ Mavs adapted sports program. 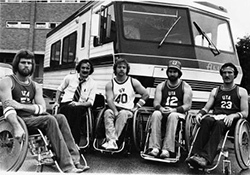 The exhibit also showcases other disability rights initiatives to come out of UTA—such as the non-profit Helping Restore Ability, public transit activism, local K-12 adapted sports programs, and the Arlington Mayor’s Committee on People with Disabilities. An opening reception includes a panel discussion at noon Wednesday, May 4, in the sixth floor parlor of the Central Library. Panelists are Wayne Duke, former vice president for student affairs; Laura Kelsey-Raney, sister of Jim Hayes, founder of UTA’s adaptive sports program; John Dycus, co-founder of the Arlington Handicapped Association and UTA alumnus; and Mark Knoblock, Freewheeler wheelchair basketball player and UTA alumnus. The exhibit, which runs through Sept. 16, is in the sixth floor parlor of the Central Library. Exhibit and discussion sponsors include UTA Libraries, the History Department, the College of Liberal Arts’ Festival of Global Ideas, and the Office for Students with Disabilities. Opening Reception: Bachelor of Fine Arts Exhibition Works by 44 graduating art students, including drawing, sculpture, glass, printmaking, film/video, photography/digital imaging, and visual communication design. 5-7 p.m., The Gallery at UTA, Fine Arts Building. Through Thursday, May 14. Art and Art History. Via Dance A collection of dance works by UTA faculty, student choreographers, and guests that includes includes contemporary ballet, modern, musical theatre, and tap. Tickets $7 faculty, staff, students, seniors; $10 general public. 8 p.m. Mainstage Theatre, Fine Arts Building. Also, 8 p.m. Saturday, May 7, and 2:30 p.m. Sunday, May 8. Theatre Arts. Salute to Community Bands Eight of the nearly 40 community bands in North Texas perform, folk songs, and contemporary pieces. Free. 11 a.m.-9 p.m., Texas Hall. See the schedule. Music. Commencement Ceremonies College Park Center. Commencement. Friends of the Library Debra Winegarten, author of Oveta Culp Hobby. 7:30 p.m., sixth floor parlor, Central Library. UTA Libraries. MavsArt Enjoy the art of UTA faculty, staff, and students. See the online gallery. 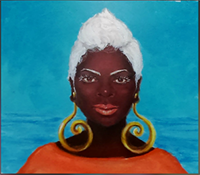 At right, woman in gold, blue, orange, brown by Miston Khonje. Free. Second floor, Central Library. Through May 13. UTA Libraries. Gallery 76102: 'Tree House Divided' Works by artist Jessica Fuentes. Gallery hours noon-6 p.m. Wednesdays-Saturdays. Through May 31. Free. Gallery 76102, Fort Worth Center. Maverick baseball claimed one win, 4-1, and two defeats, 6-4 and 19-6, against Louisiana-Lafayette last weekend. The Mavs are 29-16 for the season and 9-12 in the Sun Belt Conference. Next is a series against Dallas Baptist at 6:30 p.m. Tuesday, May 7, at Clay Gould Ballpark. The softball team won Sunday's game against Troy 13-12 on Sunday after two defeats on Saturday. The Mavs are 29-16 overall and 8-13 in Sun Belt play. The team closes the regular season with a three-game series at Texas State starting Friday, May 6. A select group of Maverick track and field athletes will compete Saturday, May 7, at the Longhorn Invitational. The Sun Belt Conference Championships are Friday-Sunday, May 13-15, in Lafayette, La. Tickets are available for the 2016 UTA All-Sports Banquet at 6 p.m. Wednesday, May 4, at College Park Center. Emily Jones, the Texas Rangers field reporter and host of Rangers Insider, is the keynote speaker. Tickets are $25. For details, contact Danielle Sanders at 817-272-0694 or danielle.sanders@uta.edu. Upcoming intramural sports deadlines are FIFA video game, Wednesday, May 4; and poker tournament, Thursday, May 5.